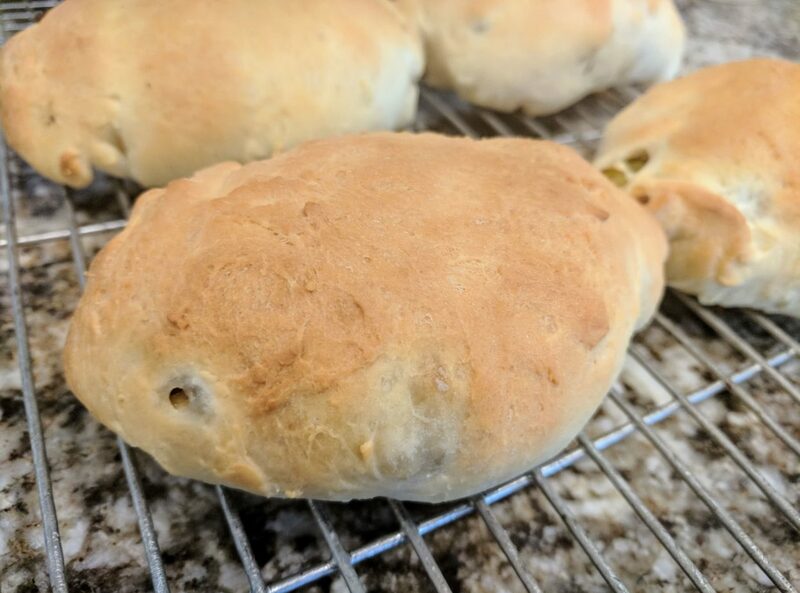 I grew up eating cabbage rolls as a child, eagerly looking forward to visits to my Grandma in Colorado where I could eat my fill of the delicious stuffed bread rolls that were always prepared before our arrival. Later on in my childhood, I moved to Nebraska where a local fast food chain, Runza, sold a similar stuffed bread roll (but with meat). Intrigued by this, I decided to create a 100% from scratch version that mashed up my childhood nostalgia for the vegetarian cabbage rolls with those found at Runza for a more complex and unique recipe. These are not to be confused with the Russian Golubtsi that are also called cabbage rolls in larger circles. Something about these German influenced cabbage rolls seem to be only found in Nebraska and Pennsylvania. This is what I had on hand and chose to use it all. You can increase or decrease according to personal preference. I used white and brown mushrooms and sliced them. You could increase or decrease this to personal preference, or substitute in other mushrooms or vegetables. I found that you need a lot of salt and pepper to season the cabbage, so taste throughout the cooking time to ensure the seasoning is right. Prepare the dough combining the 2 cups of flour (280 grams) and the yeast in a mixing bowl. In a medium saucepan, heat the milk, natural sugar, butter, and salt until the butter is just barely melted. I take this off the heat before the butter has completely melted, swirling the pan until it this is achieved. The mixture will get too hot if you allow it to melt over the heat. Using a candy thermometer or an instant read thermometer, monitor the mixture until it is in the 110-115 degrees F range. Add the warm liquid mixture to the flour and yeast that has been set aside, and crack the eggs into the mixture. With a hand mixer, beat on low speed for 30 seconds, then beat on high speed for 3 minutes. Stir in the rest of the flour (326 grams) and knead for 6-8 minutes or until smooth and elastic. Cover the bowl with plastic wrap and set aside in a warm spot for about an hour. Begin preparing the filling. Over medium heat in a large stock pot, melt the butter and saute the onions for about 5 minutes, until translucent. Add the minced garlic and saute for about a minute, until fragrant. Add the cabbage and combine, making sure the buttered onions and garlic get evenly distributed throughout the mixture. Salt and pepper liberally at this stage. Cook uncovered for about 15-20 minutes, stirring occasionally, until the cabbage is soft. Taste for seasoning and adjust as necessary. Begin preparing any other fillings. For this recipe, I chose mushrooms and ground beef. For the ground beef, I chose a medium pan over medium heat, and simply browned the meat, breaking it up as it cooked. I added in seasonings to taste, such as onion powder, cayenne powder, and garlic powder. In a separate pan, I melted 2 tablespoons of butter and added in the sliced mushrooms, seasoning with salt and pepper. The mushrooms let off a lot of liquid, so once they had cooked down, I strained off the liquid and set the cooked mushrooms aside. All of the fillings can be prepared ahead of time, upwards of 2-3 days in advance. After the dough has risen for about an hour, remove it from the bowl and weigh the mixture. I typically have a weight of around 1000 grams and make around 12-14 cabbage rolls, so do the math accordingly based on how large of rolls you would like. Line two baking sheets with parchment paper or a silplat. Divide the dough accordingly and pat or roll out the dough balls to begin the assembly process. I try to get these as thin as possible as they bake up quite bready. Place one slice of cheese in the middle of each rolled out dough, followed by 1-2 Tablespoons each of the cabbage mixture, ground beef, and mushrooms. Pinch together the seam and place the rolls seam side down on the baking sheet. They will need to rise for 30 minutes at room temperature before baking. Once the rolls have been assembled, preheat the oven to 375 degrees F. Bake for 20 minutes (plus or minus 5 minutes, depending on your oven and the size of your rolls), until the tops are starting to brown. Remove from the oven and to a wire rack to cool. Enjoy immediately with some hot sauce and sour cream, or refrigerate and microwave or lightly toast for later enjoyment. These keep for about a week in the fridge, but they probably won't last that long. I also reheat any leftover filling and serve it alongside the rolls.